The 32-year-old mother is arrested for allegedly offering to sexually abuse her own daughters for paying online customers. Picture courtesy of the IJM. A mother has been arrested in Alcantara Town, southwest Cebu, after offering children — including a three-week-old baby — for online sexual abuse. The 32-year-old suspect was detained following an entrapment operation yesterday (Monday February 4) in which her own daughters, aged 13 and three, were also rescued. The baby taken into protective custody was said to be a cousin of the two daughters. 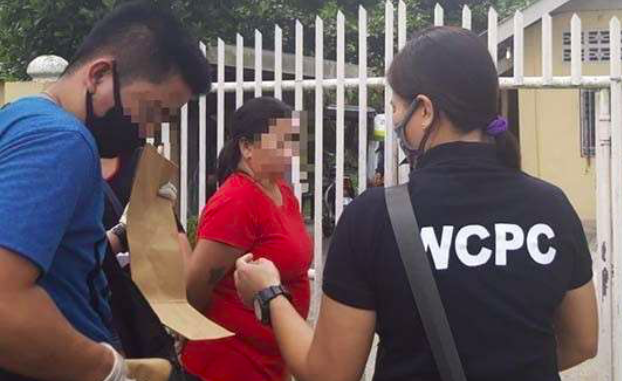 Members of the Women and Children Protection Center – Visayas Field Unit swooped on the woman’s house as she was allegedly offering to live stream the sexual abuse of her oldest daughter at about 1pm. During police surveillance prior to the raid, the suspect sent non-explicit photos of the toddler and the baby to a foreigner online. Investigations on the woman’s online activities began last November and have identified possible ‘clients’ in the USA and Australia. At the same time as the raid on the house in Alcantara Town, police swooped on a property in the neighbouring town of Ronda, owned by the suspect’s aunt. During a search, money transfer receipts were found showing previous transactions with foreigners. The operations were supported by the International Justice Mission (IJM), which campaigns globally against slavery and child abuse. John Tanagho, the IJM’s Cebu Field Office director, said: “Today’s successful Online Sexual Exploitation of Children (OSEC) rescue and arrest operation in the towns of Alcantara and Ronda is a reminder that the WCPC Visayas Field Unit is carrying out operations against online traffickers all across the Visayas. The mother has not been named in order to protect the anonymity of the children and remains in police custody. She is expected to face charges under Republic Act 10175 or the Cybercrime Law. Previously, on Sunday, the IJM was also on hand when three other children were rescued from online sexual exploitation in Butuan City. Two suspects, a 22-year-old man and a 33-year-old woman, allegedly offered to sexually abuse an 11-year-old girl and a 17-year-old boy. While under investigation, they had previously offered to abuse a 13-year-old boy. Police arrested the suspects and rescued the two boys, who are cousins, during the raid at about 12.45pm. Hours later, the 11-year-old girl, who is the younger sister of the male suspect, was rescued in Gingoog City, about two hours away from Butuan. The suspects — who again have not been named to protect the identity of the children — remain in custody at the Butuan City Police Office.